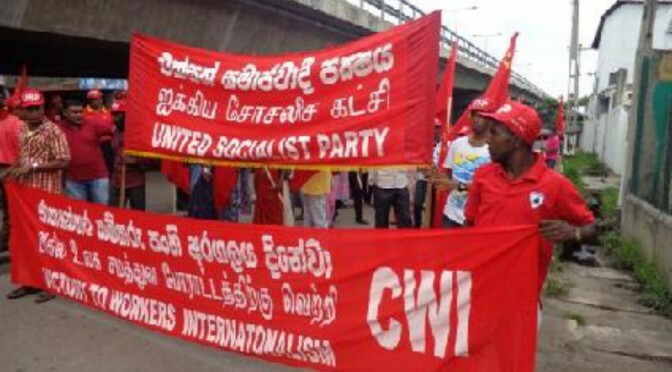 The traditional march of the United Socialist Party (CWI Sri Lanka) went ahead on May 1st in Colombo, in spite of the continuing difficulties that the Rajapakse government creates for those who argue for free speech, democratic rights and socialism. It made its way from Meetotamulla in the North of the city, through predominantly Muslim, Tamil and Portuguese areas to Grand Pass Junction. A large number of local people turned out to listen to the speeches at the USP rally in the square at Kosgass Junction. Tamil Solidarity condemns the ban of 15 diaspora organisations and news website colombotelegraph and the black-listing of around 424 individuals. This reflects the dictatorial nature of Sri Lankan regime and its continued suppression of democracy and all political activities. Sri Lankan regime is increasingly humiliated regarding the war crimes it committed during the war in 2009. Recently the regime came under heavy pressure to agree to a certain investigation mechanism. A resolution passed in the UNHRC, though it fell far short of any action against the government, marked a propaganda defeat for the Sri Lankan regime. Sri Lanka’s foreign minister Gamini Lakshman Peiris categorically denied any call for cooperation in any war crimes investigation. He declared: “Sri Lanka will not be participating in the inquiry. 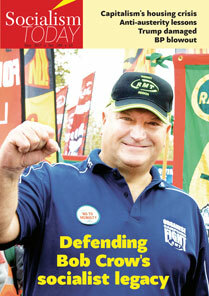 We don’t accept this inquiry and we will not be part of it”. He also declared that they don’t accept the authority of UN High Commissioner for Human Rights Navi Pillay to conduct an investigation because “Pillay has a prejudged mind” – meaning that she has a Tamil background. Previously another minister in Rajapaksa’s government Marvin Silva said he was willing to Marry Navi Pillay to give her a history lesson. Such is the level of anti-Tamil mentality that exists among the leading members of current ruling regime in Sri Lanka. Genocide – that is the recent verdict given against the Sri Lankan government by the Permanent People’s Tribunal (PPT) in relation to the carnage in the last stages of the civil war. Yet this verdict will have no value for Tamils other than serving as a propaganda point. As we know, the PPT decisions are never acknowledged by the ‘international community’ of world governments. But that is largely beside the point; the volume of established evidence that has been accepted by the PPT could have been accepted in any court of law. Is a court challenge to the Rajapaksa dictatorship likely to take place? We all know the answer. Similarly we all know the answer to the question of what is likely to come out of the United Nations Human Rights Council (UNHRC) session in March this year. With the Commonwealth Heads of Government Meeting (Chogm) taking place from 10 to 17 November all eyes are on Sri Lanka. 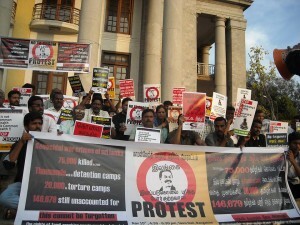 In 2009 the Socialist was almost a lone voice reporting on the government’s atrocities against the Tamil population in the North of the country. Here Senan, a leading Tamil activist and writer, analyses the post-war situation and the perspective for struggle. A spirited gathering of 100 to 120 enthusiastic and angry, predominantly youth gathered at the Town hall in Bangalore on 15th November to protest against the CHOGM event in Sri Lanka. Though the city had seen few protests on this issue in the course of the week, observers said this was the most vocal & substantiative of all.